Would like to check if this item is compatible with your car? Maxi cosi has a very easy to use web app to check this instantly. 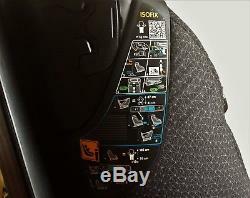 Maxi Cosi Axissfix Plus I-Size 360 Degree Swivel Isofix Car Seat River Blue 2016. 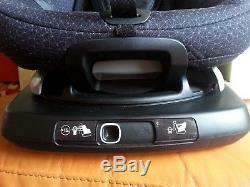 It has a built in isofix base, no separate isofix base needed. The Maxi-Cosi AxissFix comes complete with an isofix car seat and offers optimum safety when parent and child are on the move. 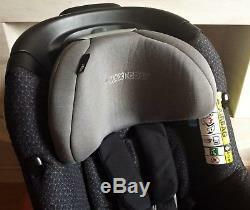 This car seat requires a top tether anchorage point to be correctly installed into the car. Suitable from 61 105 cm approx. 4 months to 4 years. Easy and safe IsoFix installation with top tether. Padded seat with angled base provides additional leg room to keep baby in the safer rearward facing position for longer up to 87cm/approx. Seat rotates 360° to make placing and securing the toddler into the seat easier. Colour indicators confirm seat is installed correctly giving parents complete peace of mind. 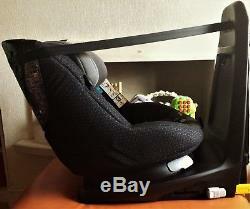 Cleverly routed top tether straps gives easy access to your child from either side of the car. Simultaneous harness and headrest adjustment. Harness straps hooks keep the harness out of the way to make it easier to place your child in the seat. Excellent side protection system for the best head and neck protection. Easily removable without unthreading the harness. 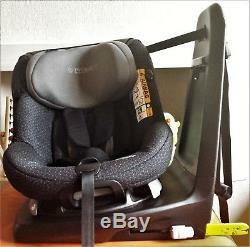 Child safety takes a new turn with this toddler Maxi-Cosi car seat. Combining state of the art safety performance by complying with the latest i-Size car seat legislation, with 360° swivelling seat making securing your toddler a breeze as the seat faces outwards. Parents no longer need to lean over and squeeze in between the car seat and the back of the front seat thanks to the clever rotation system that has been integrated into this modern car seat. Front-on access is easily achieved by simply turning the seat towards the parent, and within seconds they can buckle up their child and rotate the seat in the correct travel position. 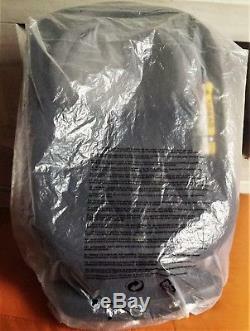 Its suitable from 61 to 105 cm approx. 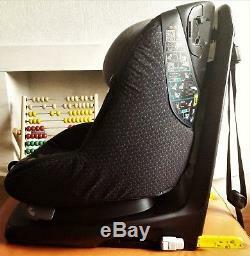 4 months to 4 years, this advanced car seat offers rear-facing travel up to 87 cm approx. 2 years to increase head and neck protection for your child in the event of an accident. It can also be easily rotated from a rearward to forward facing position, allowing parents the flexibility to make the choice at which stage their toddler should be moved to a forward facing position. For parents' convenience this car seat offers easy and secure installation using Top Tether and IsoFix connectors that lock the car seat to the body of the car. Cleverly designed colour indicators confirm when the seat is correctly installed, giving parents complete peace of mind. This i-Size car seat features four recline positions in both directions and a comfortable padded seat that can be rotated in every sitting position. 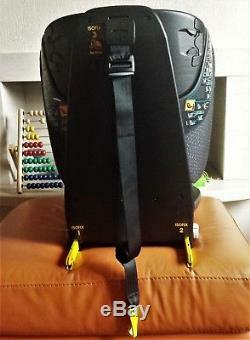 It features harness hooks and one-pull harness system that enables parents to secure their little one in seconds. 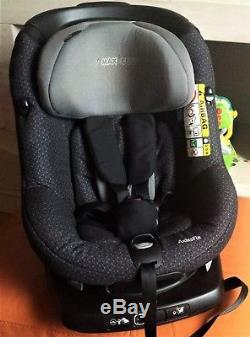 The harness and headrest can also be adjusted simultaneously to suit the height of the child. 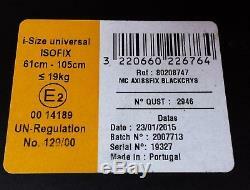 The item "Maxi Cosi Axissfix I-Size 360 Degree Swivel Isofix Car Seat Black Crystal 2015" is in sale since Thursday, June 7, 2018. 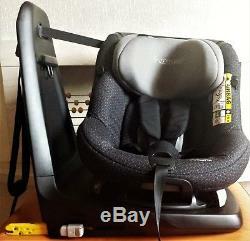 This item is in the category "Baby\Car Seats & Accessories\Car Seats". 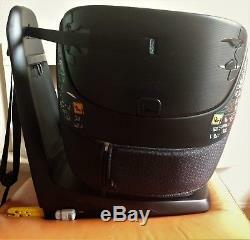 The seller is "miraarda" and is located in Nottingham.